D'Angelico Excel Model Arch Top Acoustic Guitar (1948), made in New York City, serial # 1786, natural lacquer finish, flame maple back and sides, spruce top; maple neck with ebony fingerboard, original brown hard shell case. This is a lovely example of an original John D'Angelico Excel in natural finish, substantially unaltered if well-used since its creation in 1948. While this was not D'Angelico's most elaborate or expensive guitar creation (that distinction belongs to the 18" New Yorker), each 17" Excel was still individually built to the same high standard with all the care and beauty that characterizes the purely handmade D'Angelico instruments. Many players actually preferred the slightly smaller and easier to handle Excel to the New Yorker, which even after it was no longer the flagship model was still ordered regularly throughout the master's career. This Excel is a 17 1/4" body arch top guitar from the period that saw the full flowering of D'Angelico's talents as a guitar maker, made shortly before the cutaway-style body became the more commonly ordered instrument. It is registered in the D'Angelico ledgers as being sold in early April of 1948 to a player named Sam Williams. This Excel is typical of late-1940s D'Angelicos, built with the highest-grade materials throughout. The top is made of very fine spruce, bound in 9-ply celluloid and finished in a beautiful natural finish that has ambered somewhat over time. The f-holes are multi-bound as well. There is a superb and very attractive curl figure to the maple throughout. The flared peghead is triple-bound and faced in ebony, with a pearl "D'Angelico" inlay and "Excel" on an engraved pearl block underneath. The ebony fingerboard is multi-bound with large pearl block inlay. The neck is a fantastic single piece of curly maple with a very large heelcap. The tailpiece is the usual and elaborate engraved and gold-plated trapeze seen on many D'Angelico guitars from this period, with the master's logo written on the crossbar. The bridge is adjustable ebony with the typical slanted, but not compensated, saddle and pearl blocks inlaid into the base. The top is parallel braced, as is common with earlier D'Angelicos. The tone of this guitar has an overriding sweetness and balance that is the hallmark of this maker's best work, while not sacrificing volume. This guitar retains the earlier parallel bracing common to the 1930s; compared to many later X-braced cutaway D'Angelicos from the 1950s, this guitar still has a pronounced swing-era punch, quite able to drive an ensemble while still offering a beautiful and exceptionally responsive tone when played solo. Overall length is 42 in. (106.7 cm. ), 17 1/4 in. (43.8 cm.) wide at lower bout, and 3 3/8 in. (8.6 cm.) in depth, measured at side of rim. Scale length is 24 3/4 in. (629 mm.). Width of nut is 1 11/16 in. (43 mm.). This guitar's history is written all over it, but it remains a magnificent instrument both to play and to hear. It shows the signs of a lifetime of playing, but remains remarkably original with no cracks, major damage, or repairs, just some small typical player's alterations over time. The lovely ambered natural finish remains original overall, with checking and dings, but the only large area of loss to the lacquer is a typical belt-buckle wear spot to the back. The celluloid binding is in excellent shape with no shrinkage or cracking; the original pickguard did deteriorate some time back and has been replaced with a very finely made and accurate reproduction, which now has enough age that it has started to shrink upwards just a bit, so it's looking very authentic. The top underneath the 'guard has some light staining to the finish from celluloid outgassing, but no residual damage to the wood. The original hardware, including the Grover Imperial tuners, Stairstepped D'Angelico engraved tailpiece, and beautiful carved ebony bridge, are all intact and fully functional with the gold plating worn down to muted metal in many places. The original side-of-the-neck strap hook has been removed and the hole filled; a more typical strap button has been added to the upper bout. The two small "vampire" holes on the side of the neck from a DeArmond bracket have also been filled, and there is a currently non-functional jack remaining in the typical place on the lower side. As many players might elect to add a floating pickup, we have elected to leave this in place for now. The original frets are crowned fairly low but very functional, the neck dead straight, and playability is excellent. 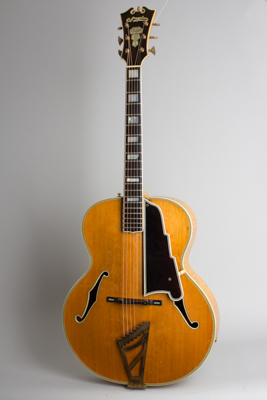 As with many of the best of John D'Angelico's creations, this guitar sings with a voice that is hard to describe -- warm and even with a perfectly balanced tone, one of the nicest late swing-era guitars one could wish for. This is simply an exceptional player's guitar; certainly that is what it was built for, and almost 70 years later, it is still true. Overall Excellent - Condition.